Produced by CBS Television, post 1985, with Douglas Edwards. This is the soundtrack (recorded by John Allegro from his TV to cassette) of a film made by CBS and still in existence, though not screened since the 1980s. 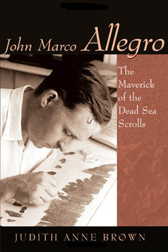 John Allegro discusses the importance of spiritual healing to the Essenes of Qumran: how their scrolls suggest they saw themselves as heirs to the secrets of healing brought to earth by the Fallen Angels. He argues that this Essene tradition of healing lay behind the early Christian preoccupation with faith healing, exorcism and miracles, and that both sects saw healing as a way to restore the soul to God.